Modern tourist hotels in Korea in major cities and tourist areas are registered with the government and graded: super deluxe (5-star), deluxe (4-star), first class (3-star), second class (2-star) and third class (1-star). A service charge of 10% and 10% VAT are included in hotel bills; tipping is not necessary. This is an inexpensive way to experience Korean culture and meet other tourists. Modest in style and decor, many are re-modelled family homes and so often have a shared bathroom. Contact the Korea Tourism Organisation. Campsites are located throughout the country in national parks, recreational forests and amusement parks. Services such as 'tent rent' are provided as well as shower facilities and bathrooms. Contact Korea Tourism Organisation for details. Budget: The Korea Tourism Organisation can provide a list of yogwans, reasonably-priced motels where rooms usually consist of a small mattress and a firm pillow on the ondol, Korea's traditional floor-heating system. Some may have Western-style rooms too. Homestay accommodation: Supported by the Korea Tourism Organisation, this registered nationwide home-stay placement service offers visitors the chance to live in a Korean home, giving a unique perspective on local life. Cabins: Situated in forests and amusement parks, log cabins are ideal for families and groups. Mountain huts and shelters (daespiso) are located in national parks and are great for hikers. They are equipped with basic beds, light meals, clean drinking and bathing water. 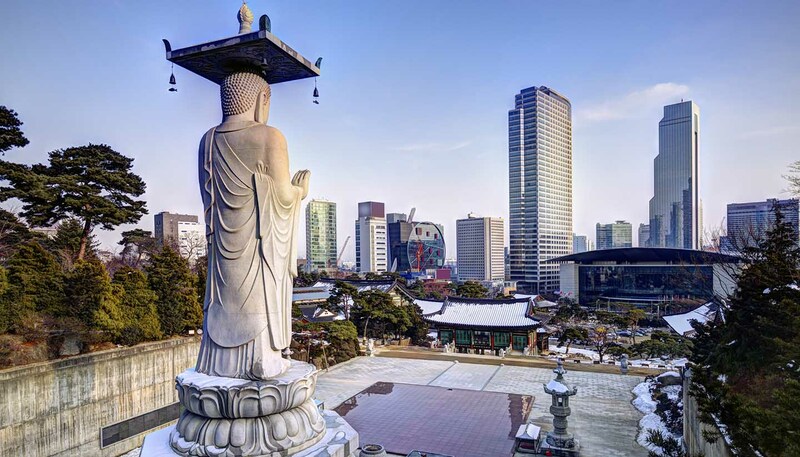 Unique accommodation: Korea's temple stay programme (http://eng.templestay.com) gives visitors a glimpse of Buddhist life. Once shunned by all but the "enamored," Korean love hotels are gaining popularity among younger travellers looking for inexpensive (and often posh for the price!) accommodation. Youth hostels: There more than 70 youth hostels located across the country. Many Koreans are enthusiastic members of www.couchsurfing.org and other "stay in my home" websites, as well as airbnb.